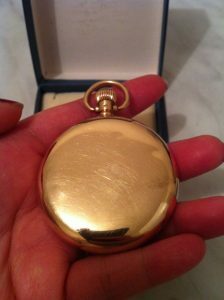 This is a 9ct Record pocket watch circa 1920s. The movement is made in Switzerland by Record Watch Company. It has 15 jewels mechanism. 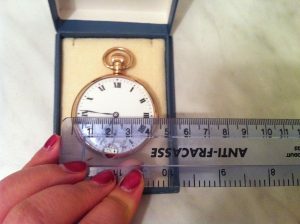 Lovely open face pocket watch! The diameter of the watch is approximately 44mm. I have not measured the weight, but I think it is around 75-80 grams. The case has 9ct hallmark of Birmingham with serial number 230261. The case of the watch is made in England by Dennison Watch Case Co Ltd and it has a hallmark of ALD referring to Aaron Lufkin Dennison. 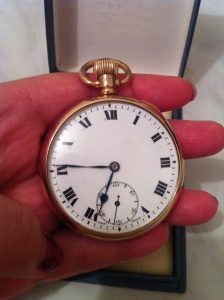 According to Dennison watches website, Aaron Lufkin Dennison is an American watchmaker who founded Waltham Watch Company, a prestigious American watch brand, in 1850. He then moved to Birmingham – England in 1871 and created A.L.D trademark in 1872. Since then the Dennison legacy begins. 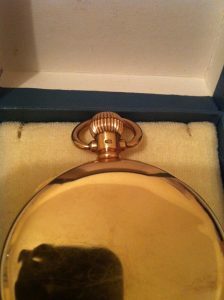 His son, Franklin Dennison, took over the company in 1905 and created Dennison Watch Case Co Ltd.
Below the crown there is a hallmark of “9 375” for 9ct gold. There is also a stamp of DQ meaning Dennison Quality. 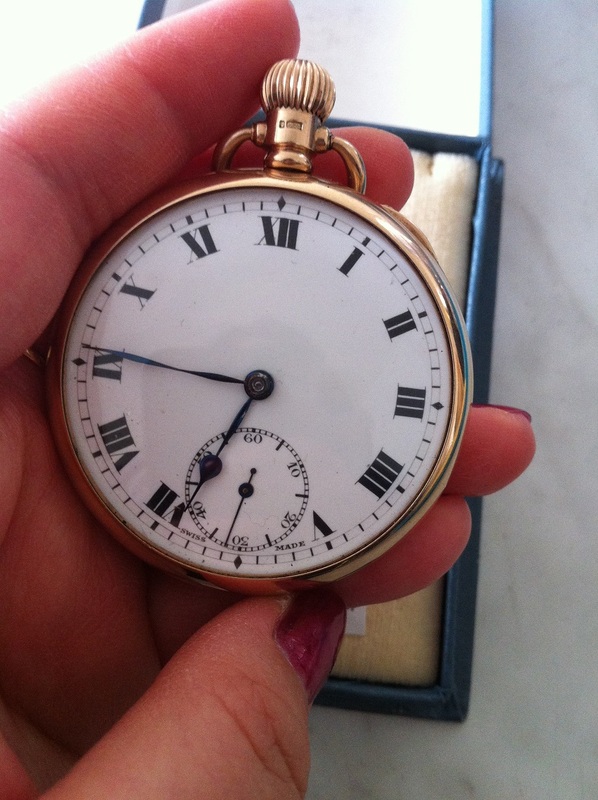 The dial of the watch has roman numerals and blue hands. 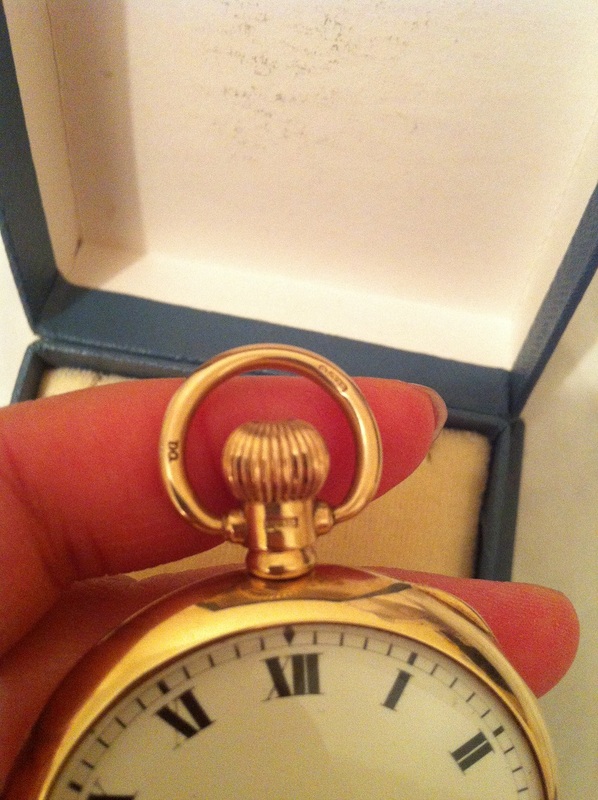 It also has the second dial above the six o’clock.